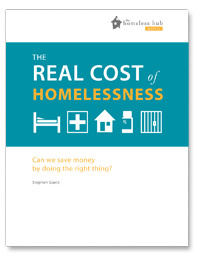 This report summarizes what we know about the cost of addressing homelessness by looking at key literature from Canada and the United States. What becomes clear is that the status quo is actually really expensive. It may seem counter intuitive to suggest that it is cheaper and more cost effective to provide people who experience homelessness with the housing and supports they need, rather than simply provide them with emergency supports through shelters and soup kitchens. However, the research reviewed here indicates that this is actually the case. The best social and economic policies should be based on research and evidence, and in this case, the evidence points to the fact that if we do things differently, we not only achieve better social outcomes, but we also save money.